We have been painting with pom poms for years! 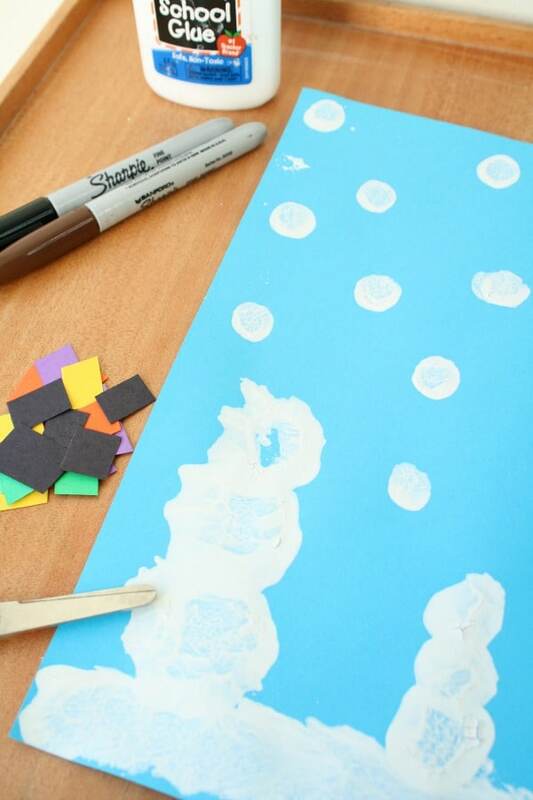 It such an easy way for kids to make their own paint brushes and experiment with making different marks on paper. 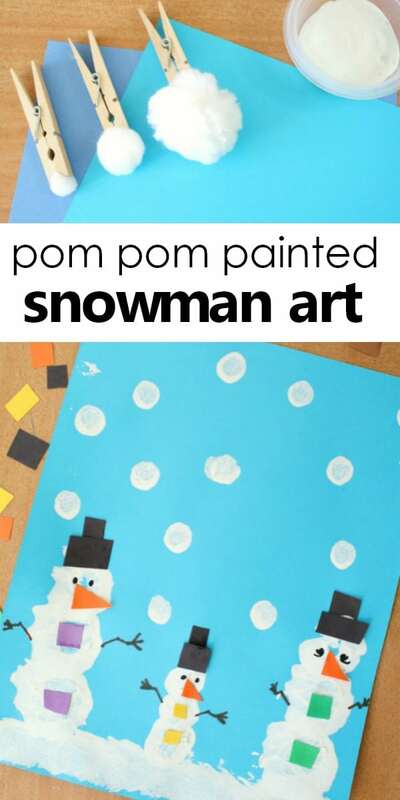 During Christmas we often use pom poms to paint Christmas trees, but there are so many possibilities for completely open-ended painting or seasonal projects. 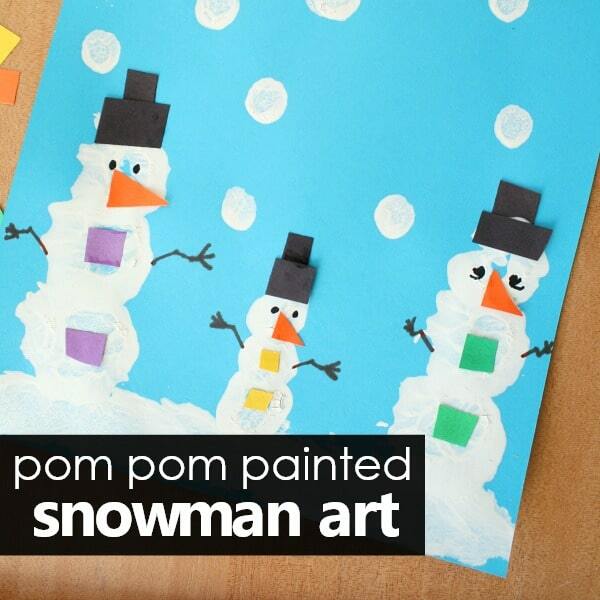 For our snowman theme we used different sizes of pom poms to create wintery pom pom painted snowman craft. Each creation turned out completely original, and kids of all ages can join in! Clothespins-We always keep a stack handy like these ones given to use by CraftProjectIdeas.com. Pom poms of assorted sizes. 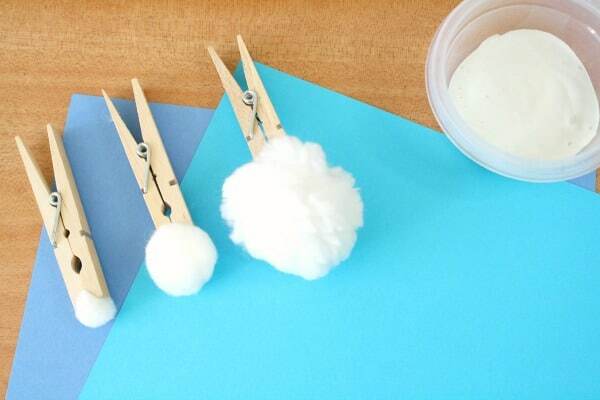 Pinch a pom pom in between each clothespin. 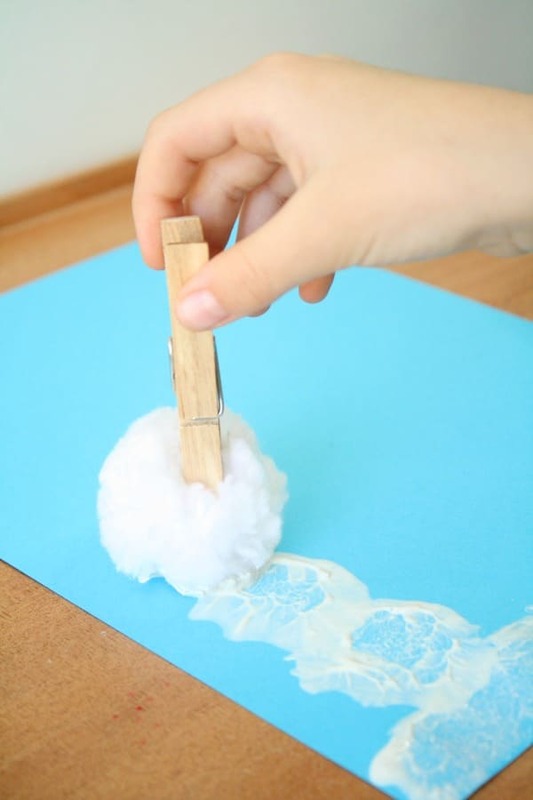 Show kids how to grip the clothespin without squeezing it so that the pom pom stays put. Markers of your choice-We prefer to use Sharpies with close adult supervision, but washable markers work perfectly fine too. Scrap paper-We save a bin of paper bits from craft projects so we always have some scraps to use for collage projects like this one. Watch this video tutorial or read on for the full description. You can guide children as much or as little as you’d like in preparation for this activity. We love to let kids create as they see fit, but it can also help to establish a little background knowledge beforehand when possible. 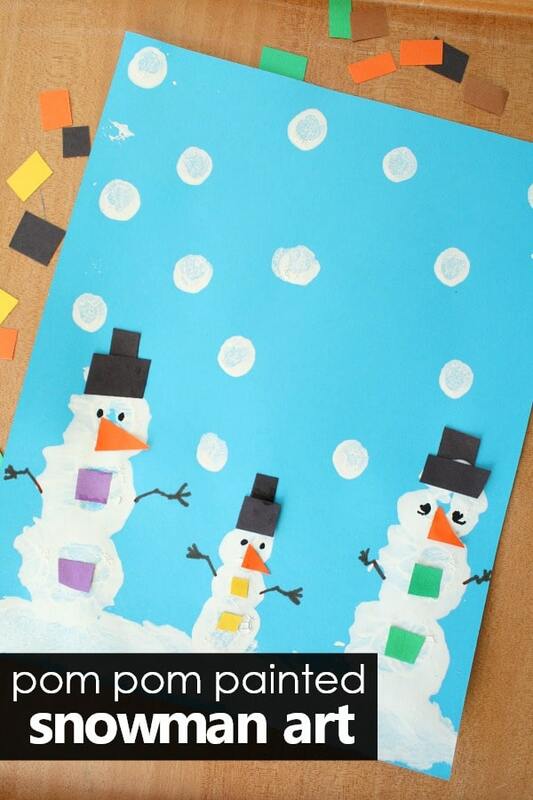 For this activity read a few snow books and discuss the setting, the features of snowmen etc. 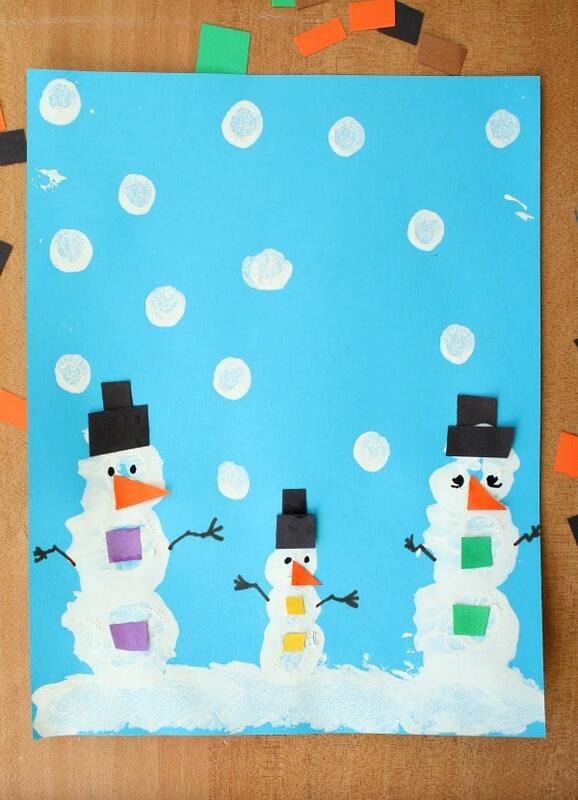 Let kids make as many snowmen as they’d like. Then add in extra details like the ground and falling snow. Encourage them to create on their own without a lot of adult input. Once the paint dries set out the original painting with glue, scissors, scrap paper, and markers. Invite kids to add details to finish their pictures. I like to leave small bits of paper and let kids cut them to fit their own vision. 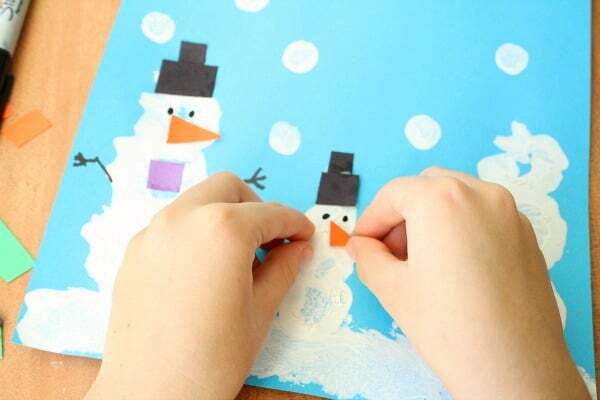 It adds an extra layer of fine motor practice and ensures that each child’s creation is unique. Once kids are finished pre-writers can dictate a sentence about the snow family they created, and older kids can draft a story of their own to share with friends. 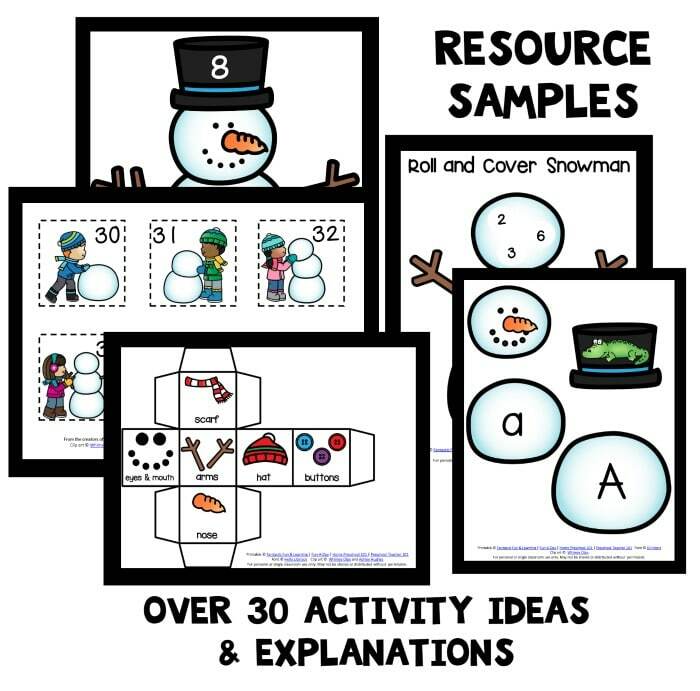 You can even compile them into a class book of snowman adventures if you’d like!